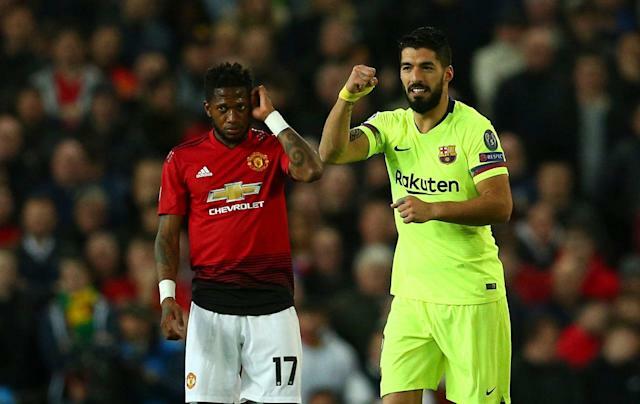 In a game that initially lived up to the hype and then tapered off, Barcelona forced Manchester United into an early own goal and won 1-0 at Old Trafford in Wednesday’s Champions League quarterfinal first leg. As expected, the Red Devils grew into the game after that, but couldn’t produce an equalizer at the other end. There were a pair of penalty shouts – one for an alleged Busquets handball that looked eerily similar to the call that helped United reach the quarterfinals, the other for Gerard Pique appearing to foul Scott McTominay in the box – but the appeals fell on deaf ears. The first half was an entertaining affair, with Barcelona dominating the early run of play and fortifying possession around United’s defensive third. The goal came decidedly amid the run of play, and perhaps Barca let its foot off the gas a bit after securing the away goal rather quickly. Apart from the penalty claims, the game didn’t really settle into a groove in the second half, and ultimately Barcelona was able to leave with an advantage heading back to the Nou Camp. The loss is just the second in 15 homes matches across all competitions for Manchester United under Ole Gunnar Solskjaer. The first came against Paris Saint-Germain in the Champions League round of 16, which United overturned in stunning fashion. As impressive as that was, PSG missed Neymar and still lacks the wherewithal to grind out Champions League results when it really needs them. That’s not Barcelona. United, the ball is firmly at your feet.